About The Palmwood in Kauai, Hawaii. Book a stay at our bed and breakfast. The Palmwood guesthouse is a secluded and private 5 acre estate. The hilltop retreat, inspired by the mountain Ryokans (country inns) of Japan, is nestled amongst the rolling green hills of Moloa'a - a lesser known enclave on the North Shore of Kauai, Hawaii. The beautiful setting is ideal for those seeking a destination spot away from the crowds. Yet, the location is central providing a great jumping off point for those wanting to explore all sides of the island: the picturesque North Shore encompassing Hanalei, Haena and the famous Na Pali Coast, the small local towns and homesteads dotting the Eastern Shore, the fancy restaurants, resorts, and golf courses along the South Shore and in Poipu, and the Naturalist's dream - Waimea Canyon on the West Side. With a passion for design and an obsession to detail, The Palmwood provides a sanctuary for the body as well as the mind. Spaces are well thought out and elegantly appointed with furniture from Australia's renowned Pacific Green Furniture and various local artisans. Food is locally sourced and meals are meticulously prepared using only the finest ingredients and produce, always taking in to into account any special requests guests may have. 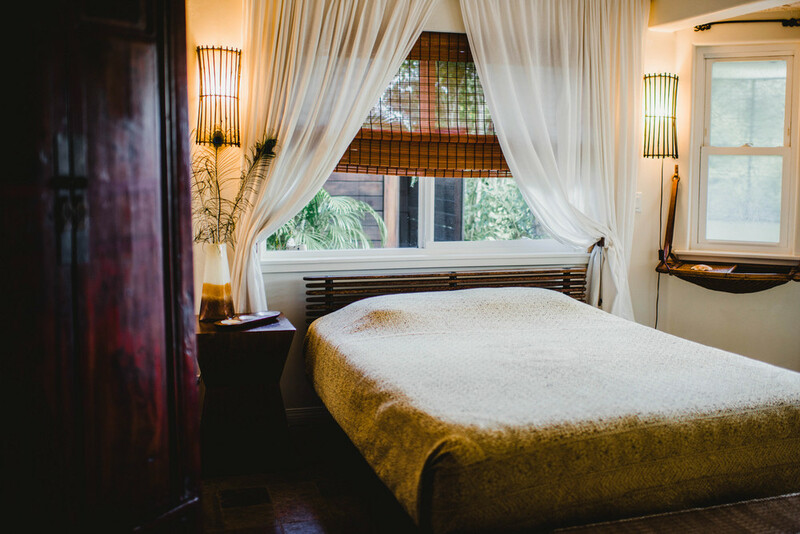 Offering rustic charm and a simpler way of life without forgoing the small luxuries that make it all worth it, The Palmwood is redefining what it means to be a bed and breakfast. Our most popular room. The East Room has its own private entrance, lanai (patio) and, full en suite bathroom as well as private outdoor shower and two person hot tub. The room is on the small side, however has an open and breezy feel with vaulted ceilings, french doors and large windows that showcase the surrounding gardens. Our largest room, occupying the entire third floor. 15 foot high vaulted ceilings and large windows give the suite a sense of airiness. Sliding glass doors open up to a private balcony with a stunning 180 degree view of the mountains and Moloa'a Valley. The suite also features a large bathroom with double sinks, shower and an en suite jacuzzi tub. Wood floors throughout and a large walk-in closet. The West Room has an identical interior floor plan as the East Room with full en suite bath and shower. The outdoor area is appointed with a larger lanai (patio) than the East Room. There is also a two person hot tub, as well as an outdoor shower with a beautiful water feature of five waterfalls and pond. "A unique and perfect setting for our time on Kauai"
"Great sunrise and sunset views with fantastic breakfasts" – S.B.